Mathéo wakes to find his room in tatters. It is like something from a nightmare and he can’t remember what happened. He can’t remember anything after the Nationals last night, where he won gold in Brighton, but now he is back in London and full of pain. The following weeks are torture, remembering snippets of what happened to him that night and what it is doing to him. It is obviously Mathéo is full of hurt but he has to carry the secret of its source around with him otherwise it will cause lives to be crushed, including his own. I honestly don’t know what I can say about this book. It is my second Tabitha Sazuma read and I’ve come to the conclusion that she doesn’t like to make her readers happy! The pain in this book was so great that I felt it myself whilst reading, its an emotional rollercoaster that drags you along and chucks you around on the way down. The story is hellish. I can’t go into it too much for fear of ruining the ending but there is raw pain and confusion all the way through, there are flashbacks to times that appear to be perfect, the lead up to the morning Mathéo wakes up in his room makes his entire live seem perfect and that contrast to the Mathéo we come to know after that night really draws your attention to how much whatever happened has affected him. I honestly don’t want to give anything away so all I am going to say is that Tabitha Sazuma has an incredible talent, even without a first person narrative you get drawn in to Matties life and his feelings, your heart is breaking all the way through when you witness just how much he is hurting emotionally and you wouldn’t be able to pick up on that without the incredible writing style. The ending made perfect sense to me and I understand exactly why it ended in the way it did, even if I didn’t like it! This is quite possibly the shortest review I have ever written, but that is due to me not wanting to give anything away, you are just going to have to trust me that this book is worth a read and once read it will stay with you for a long, long time. 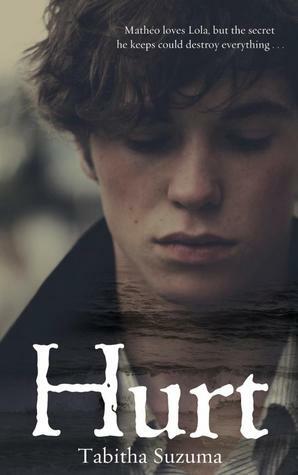 Hurt was published on September 5th by Bodley Head. My copy was sent from the publisher in exchange for an honest review. I like a good heartbreaker! I will keep an eye out for this one. I’m planning to read this over the weekend. After Forbidden I’m ratehr nervous!